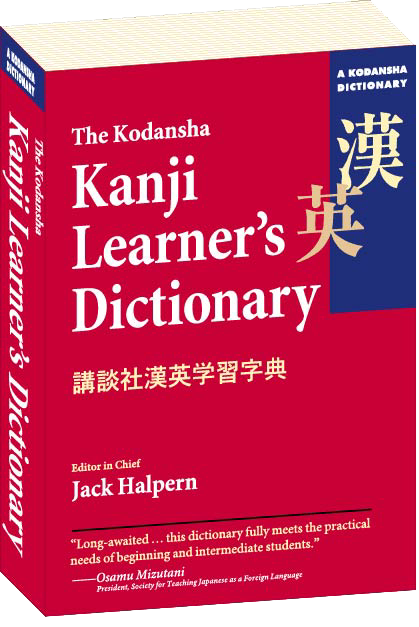 Based on the world-renowned ITC/ Kenkyusha New Japanese-English Character Dictionary, The Kodansha Kanji Learner's Dictionary has become the standard reference work for kanji and has enjoyed the praise of renowned scholars and learners throughout the world. "Long-awaited... this dictionary fully meets the practical needs of beginners and intermediate students." More than ever before, learners of Japanese need effective tools designed to break through the formidable barrier posed by the Japanese script. This dictionary aims to answer the urgent need for an easy-to-use kanji dictionary small enough to be easily carried around yet detailed enough to satisfy the practical needs of serious beginners and intermediate learners. Its basic goal is to give you an in-depth understanding of how kanji are used in contemporary Japanese. A totally new system gives you instant access to a wealth of highly useful information, enabling you to quickly locate the meanings, readings, and compound words for about 98% of the most frequently used kanji. The Kodansha Kanji Learner's Dictionary is the latest addition to Kanji Toolkit (KIT) -- a series of computer-edited dictionaries and other useful learning aids for the effective mastery of the Japanese script. The new dictionary is based on the first installment of the series, the NTC/Kenkyusha New Japanese-English Character Dictionary, which has already become established in Japanese language education circles as a standard reference work, and has enjoyed the praise and support of world-renowned scholars and countless learners of Japanese all over the world. A unique feature of Kanji Toolkit products is the core meaning -- a concise keyword that defines the most dominant sense of each character, followed by psychologistically-ordered character meanings that clearly show how a few thousand basic building blocks are combined to form countless compound words. Another unique feature is an indexing system that enables the user to locate entries with great speed and facility. The one feature that really distinguishes this dictionary -- that puts it in a class of its own in the history of kanji dictionaries -- is that it was carefully designed to strike a perfect balance between two fundamentally conflicting needs: that of portability versus comprehensiveness. On the one hand, it does provide the learner with immediate access to detailed information on more than 98% of the characters used in contemporary Japanese; on the other hand, it is compact and light enough to be easily carried around in one's handbag or briefcase. The principal features that make this dictionary a highly practical learning aid are described below. Here is a sample page (.pdf). The entries are ordered according to a scheme called SKIP (System of Kanji Indexing by Patterns), which makes it possible to look up entries almost as quickly as in alphabetical dictionaries. Each character is unambiguously classified under one of four easy-to-identify geometrical patterns 1. left-right, 2. up-down, 3. enclosure, and 4. solid -- and each pattern is further subdivided into progressively smaller subgroups for easy retrieval. Since the system can be learned quickly and does not require prior knowledge of kanji, it is extremely convenient for beginners who need to look up characters with great speed and little effort. A striking feature of this dictionary is the core meaning. This is a concise keyword that provides an instant grasp of each character's fundamental concept and links its principal senses into one conceptual unit. Since it functions as a concentrated thought package that appeals to the learner's powers of association, it is widely praised by learners and educators as a highly effective learning aid. An outstanding feature of this dictionary is that clear, complete, and accurate character meanings are grouped in clusters around the core meaning in a way that allows them to be conceived as a logically-structured, psychologically integrated unit (psychologistic ordering). The meanings are presented in a manner that shows how each character is used as a word element, and how countless compound words can be generated from a stock of a few thousand building blocks. The character meanings are illustrated by many high-frequency compounds that provide maximally useful examples of each sense. The compounds are not restricted to those in which the entry character occurs in the initial position, and are arranged in a manner that clearly shows how they are formed from their constituents. This arrangement has the special advantage of enabling you to easily infer the meanings of other compounds not found in the dictionary. A system of labels provides practical guidance on style, function, and usage. The labels indicate such useful information as the etymology, style, grammatical function, and level of formality, and clearly distinguish independent words from word elements. The Pattern Index allows characters to be quickly located from their SKIP numbers. The SCAN Method is a powerful shortcut for locating some characters almost instantly. The On-Kun Index lists the characters alphabetically by both their on and kun readings. The Radical Index lists the characters by their traditional radicals. The Direct Method for locating characters without using any index. An important feature of this dictionary is its compact size and visually attractive layout. Although it is small enough to be easily portable, the type size is large enough for relaxed browsing without eye strain. Cutting-edge DTP technology was used to achieve a harmonious blend of a wide range of type sizes and styles that make the organization of the entry self-explanatory. This dictionary presents a total of 2230 main entry characters, and approximately 41,100 meanings for some 31,000 words, word elements, and examples. This covers more than 98% of the characters used in contemporary Japanese, especially newspapers, and is more than adequate for meeting the needs of learners. Our primary guideline has been completeness in terms of quality rather than comprehensiveness in terms of quantity -- that is, the dictionary focuses on contemporary usage and the practical needs of the learner. It was designed to achieve the optimal balance between the comprehensiveness of a desktop edition and the portability of a pocket edition. The System of Kanji Indexing by Patterns explains how to quickly locate character entries. How To Count Strokes explains the principles of stroke counting. The Radical Chart presents details on the radical system.